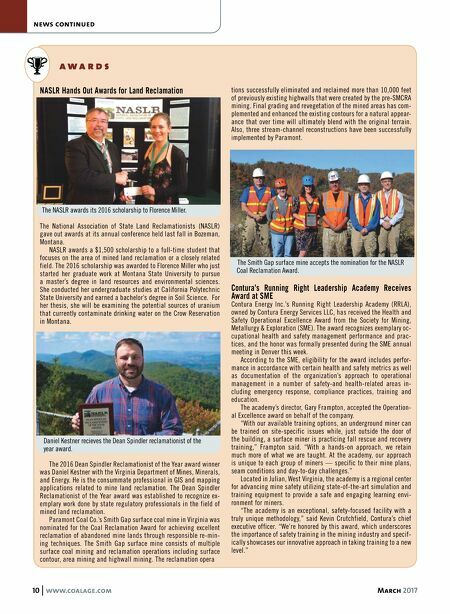 10 www.coalage.com March 2017 news continued NASLR Hands Out Awards for Land Reclamation The National Association of State Land Reclamationists (NASLR) gave out awards at its annual conference held last fall in Bozeman, Montana. NASLR awards a $1,500 scholarship to a full-time student that focuses on the area of mined land reclamation or a closely related field. The 2016 scholarship was awarded to Florence Miller who just started her graduate work at Montana State University to pursue a master's degree in land resources and environmental sciences. She conducted her undergraduate studies at California Polytechnic State University and earned a bachelor's degree in Soil Science. For her thesis, she will be examining the potential sources of uranium that currently contaminate drinking water on the Crow Reservation in Montana. The 2016 Dean Spindler Reclamationist of the Year award winner was Daniel Kestner with the Virginia Department of Mines, Minerals, and Energy. He is the consummate professional in GIS and mapping applications related to mine land reclamation. The Dean Spindler Reclamationist of the Year award was established to recognize ex- emplary work done by state regulatory professionals in the field of mined land reclamation. Paramont Coal Co.'s Smith Gap surface coal mine in Virginia was nominated for the Coal Reclamation Award for achieving excellent reclamation of abandoned mine lands through responsible re-min- ing techniques. The Smith Gap surface mine consists of multiple surface coal mining and reclamation operations including surface contour, area mining and highwall mining. The reclamation opera tions successfully eliminated and reclaimed more than 10,000 feet of previously existing highwalls that were created by the pre-SMCRA mining. Final grading and revegetation of the mined areas has com- plemented and enhanced the existing contours for a natural appear- ance that over time will ultimately blend with the original terrain. Also, three stream-channel reconstructions have been successfully implemented by Paramont. Contura's Running Right Leadership Academy Receives Award at SME Contura Energy Inc.'s Running Right Leadership Academy (RRLA), owned by Contura Energy Services LLC, has received the Health and Safety Operational Excellence Award from the Society for Mining, Metallurgy & Exploration (SME). The award recognizes exemplary oc- cupational health and safety management performance and prac- tices, and the honor was formally presented during the SME annual meeting in Denver this week. According to the SME, eligibility for the award includes perfor- mance in accordance with certain health and safety metrics as well as documentation of the organization's approach to operational management in a number of safety-and health-related areas in- cluding emergency response, compliance practices, training and education. The academy's director, Gary Frampton, accepted the Operation- al Excellence award on behalf of the company. "With our available training options, an underground miner can be trained on site-specific issues while, just outside the door of the building, a surface miner is practicing fall rescue and recovery training," Frampton said. "With a hands-on approach, we retain much more of what we are taught. At the academy, our approach is unique to each group of miners — specific to their mine plans, seam conditions and day-to-day challenges." Located in Julian, West Virginia, the academy is a regional center for advancing mine safety utilizing state-of-the-art simulation and training equipment to provide a safe and engaging learning envi- ronment for miners. "The academy is an exceptional, safety-focused facility with a truly unique methodology," said Kevin Crutchfield, Contura's chief executive officer. "We're honored by this award, which underscores the importance of safety training in the mining industry and specif- ically showcases our innovative approach in taking training to a new level." % a w a r d s The NASLR awards its 2016 scholarship to Florence Miller. Daniel Kestner recieves the Dean Spindler reclamationist of the year award. The Smith Gap surface mine accepts the nomination for the NASLR Coal Reclamation Award.